Dirt Terms 101: Soil and Mulch and Compost, Oh My! Today we’re talking about dirty words, like soil, mulch and compost. Most of the terms we use in our industry originate from those used in soil science, which explains why they can sometimes be so confusing for the rest of us. Although we don’t need to explore all of the obscure soil science terms (colluvium or congeliturbate, for example), some of the more common terms are important for making sure your garden and landscaping grow and thrive. Compost is a soil amendment composed of decomposed organic materials. It nourishes plants, holds in moisture and helps plants fight disease. Our version of this product, Organic Mountain Compost, is perfect for improving our challenging Utah soils conditions. It contains a custom blend of alfalfa, straw, grain by-products, steer manure, black peat and forest humus. This is not the delicious spread made from chickpeas – that’s hummus. In fact, humus probably doesn’t taste very good at all. Humus is the Latin word for soil but, in our context, we use this to describe the organic component of soil. Dirt that has a high concentration of humus is what we generally consider to be rich soil, like our Garden Soil Plus. Mulch is an all-purpose term used to describe any product we add to soil or topically (around plants) to add nutrients, hold in moisture, discourage weeds and to provide a uniform, top-dressed appearance. Although mulch can be made from non-organic products (chopped rubber, for example), we use this term to describe products that are primarily organic. We offer these products in a variety of colors, include our dark brown mulch and natural colored shredded bark mulch. Generically, this term refers to native dirt in a given location. If you go into your back yard and turn over a spade of unamended dirt, you will see that the native Utah soil is not dark and rich with humus. Instead, it’s dense and heavy with sand, clay, gypsum and salts. This is why it’s important to either add amendments to improve your soil or replace it in planting beds with a prepared garden soil mixture. Topsoil is another potentially confusing term. 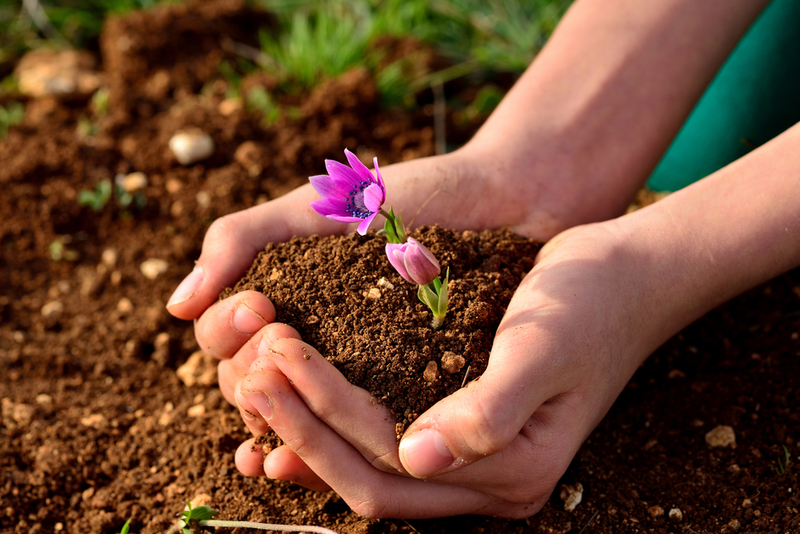 In soil science, it refers to the upper layer of natural soil. In the landscaping materials industry, we use this term interchangeably with fill dirt. Topsoil is dirt that has been screened to remove debris and create a uniform texture. However, it has not been amended or enriched in any way. Topsoil is not appropriate for use as a growing medium. However, it’s perfect for use underneath sod and as a cost-effective fill for the lower layer of planting beds. Here at The Dirt Bag, these products are our area of expertise. We can recommend the best products to help you meet your planting and growing goals and deliver them directly to your door in our signature 1-cubic yard bags. Contact us today for answers to all of your questions about soil, mulch and compost.